This was perhaps the most eagerly awaited novel in the SF/Fantasy community in 2009. 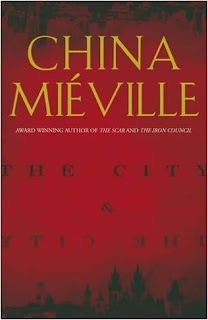 China Miéville´s The City and The City may very well be his best novel since his classic Perdido Street Station. Aside from this "small" detail, this is a modern-day world, where people use computers, MySpace, cellphones, and well-known references abound (David Beckham and Star Wars are just a couple of them). This could very well be our world, for all that we know. But, as in any masterful work of literary imagination, can we say that the "real" world of The City... would be by any chance our world? Miéville creates a very credible city and then some - this "some" is another city whose borders not so much touch as clash with Beszel: Ul Qoma. Both cities are separated by a grand, twisted building, strangely called Copula Hall. Like (and at the same time unlike) the old Berlin Wall, Copula Hall is the only legal way station between the cities. Which can be a little disturbing to unaccustomed foreigners who can´t ignore the fact that both cities coexist in the same space. Beszel and Ul Qoma are one and the same, intertwined. The denizens of one city must learn since childhood the hard and high art of unseeing buildings and people from the other, for not to incur in penalties from this and perhaps other world: as if all the laws forbidding contact between cities without proper permits weren´t enough, there is also another thing to be concerned at all times: the Breach. Nobody knows exactly what the Breach is. But everyone knows very well what it does: it fixes things. It may return a stray person to his/her original city, for example. (It will probably do it to a foreigner person - even the Breach seems to want to avoid diplomatic incidents) Or it may take the person away. For good. When Inspector Tyador Borlú, of the Extreme Crime Squad of Beszel, finds the body of a cruelly murdered foreign girl in the outskirts of the city, it looks like she was a victim of an assault - but soon enough the evidences begin to point to conspiracies involving radical political groups and end up leading him to the other city: Ul Qoma. As if all of this were not enough, Borlú must also deal with what lies (or what some people thinks that lies, which, when you deal with mad people and conspiracy theory types, sometimes can be the same thing) between the city and the city: a third city. Orciny. An entire territory which is an urban legend in itself. A myth ancient and at the same time invisible, even more unseeable than the inhabitants of Beszel to those of Ul Qoma and vice-versa - but it also may be the key to the murder of the girl. And Borlú becomes too much involved in this to turn back now. He must find Orciny at all costs, even if it doesn´t exist. As far as strangeness go, we don´t get to see anything as flamboyant as the Remades of the Bas-Lag Universe, for instance, but on the other hand, we learn of the existence of the insiles, exiles inside the cities, between them. And what about the topolgangers - doppelganger places, zones that are the same for the denizens of both cities, but that each see in a different mindset? If Chilean writer Roberto Bolaño (2666, The Savage Detectives) were alive, he would be a serious candidate to be the Julio Cortazar of the XXI Century. China Miéville is on the same league, but in a slightly different key: he may as well be a Borges for the XXI Century. The City & The City is not to be missed.